Years before, as Splinter was bringing home some pizzas to his very young students, he overheard a conversation on the street via a sewer grate. A young woman named Lynda Ling was being pressured by her attorney to sell her martial arts school and weaponry to Slujjcorp, which had designs on the dying neighborhood in which the building stood. Lynda told her lawyer that her deceased husband, David, a martial arts movie star, had left the building and business to her, and she had no intention of selling out. Reluctantly the attorney tells the woman that he will fight the corporate buy-out as long as he’s able and he drives off. Splinter reveals that before he had mutated, he had been good friends with Lynda and David. Later that night, as Splinter watched the shop from the sewers, several thugs arrived at Lynda’s studio and told her to move out. Lynda, a martial artist in her own right, did not take kindly to their threats and proceeded to kick their butts. The hoodlums fled and Master Splinter returned home. 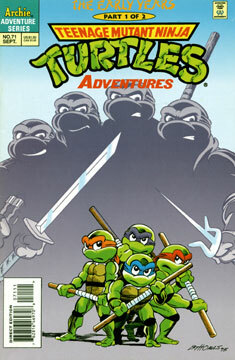 Additonal Material: 12 page TMNT story by Ryan Brown, Doug Brammer, Dave Garcia and Steve Bissette.